Welcoming the World to Branson! “ABBA Tribute - Thank You for the Music” is a dynamic tribute to this treasured Swedish, pop super-group. It’s an exciting, modern interpretation of timeless ABBA classics, as well as a wide array of musical arrangements that pay tribute to ABBA's original sound. Powerful four-part harmonies, high-energy dancing, big personalities, and the unforgettable hits of ABBA make this contemporary musical tribute a special treat! Mamma Mia, Dancing Queen, and Waterloo are just a few of the highlights of this nostalgic musical adventure. In this Branson show you’ll get a bit of ABBA history, a few funny stories, and enough music to keep you humming for days after the show! 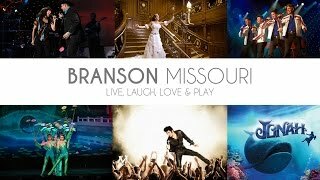 Diehard fans, as well as those just discovering ABBA’s music, will absolutely love “ABBA Tribute - Thank You for the Music,” playing in the place that music calls home...Branson, Missouri! Contact Branson.com today for more info. Branson Travel Agency is a wholly-owned subsidiary of Branson Tourism Center. Copyright © 2019 Branson Travel Agency. All Rights Reserved.